When sixteen-year-old Jodi Greer goes for a walk outside, she finds her childhood friend Neil Moran sleeping near their private retreat. She enters his dream, at first trying to awaken him so they can return home, but he is unable to wake up. The two friends thus embark on an interesting and dangerous journey together in the beautiful but equally frightening fantasy world of Aten. The author creates a combination of action thriller and romantic fantasy in this novel. 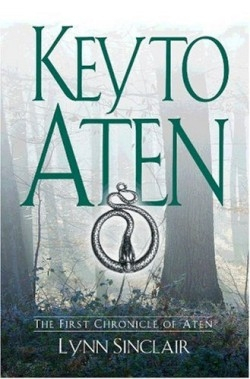 She lives in Ontario, Canada, where, she says, the beauty of the forests and fields gave her inspiration to create the alluring, though often scary, world of Aten. Sinclair plans a series of books that will take readers on more adventures with Jodi Greer and her friends. In Key to Aten, Sinclair cleverly combines the elements of fantasy writing—setting the story in an unreal world with incredible characters who have experiences that are not likely to come true—while she explores the very real confusion of the teenage years. Jodi and Neil both endure similar family problems and are called on to make important decisions as they gain more independence and responsibility in their families. When the book opens, Jodi grudgingly admits that she is “the only sixteen-year-old girl in town who wasn’t working.” Jodi has to stick close to home all summer to care for her mom. Jodi and Neil’s friendship is tested as they travel together in Aten. But the two never forget where they came from or their devotion to each other. While the friends protect each other on their journey through a distant and strange world, they meet people whose beliefs and traditions cause them to question their own belief systems. Readers, too, can take a moment to consider the theme of conflicts in decision-making—and whether they agree with the decisions that Jodi and Neil make about their lives in Aten, and, most significant, their choice whether to remain there or to return home. This compelling but complicated novel, with its appealing female protagonist, who asserts herself despite the danger she faces, will attract young adults who enjoy an adventure and acknowledge the uncertainties of adolescence.